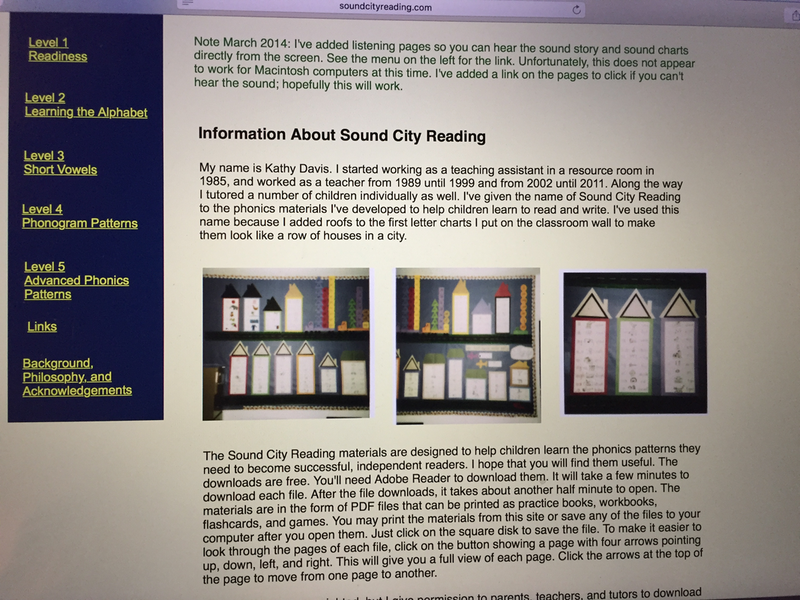 I have added a new survey to allow anyone who has used the Sound City Reading program to share their experiences with visitors to this website. I believe that these entries will be very helpful to individuals who are looking for instructional materials to teach reading but aren't sure whether or not the Sound City Reading materials will work for them. I've received many e-mails over the years from people all over the world who have used Sound City Reading materials with success. If you have a story to tell about these materials, I hope you will share it. Look under the BLOG menu heading and go to Share Your Experience. You may fill out the entry form, or if you prefer, e-mail your information directly to me at kathjdavis@gmail.com. I will post them on a designated page on this site for others to see. Thank you in advance if you choose to participate. All entries will be greatly appreciated. 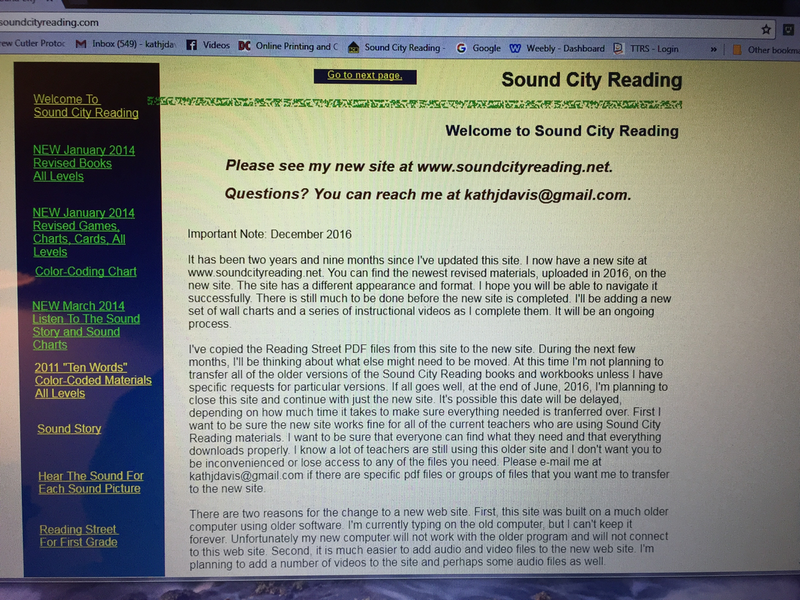 Today I contacted the hosting service for the old Sound City Reading website at www.soundcityreading.com to ask them to close the site. It should be down as soon as they can fulfill the request. Within a short time, the .com address will automatically forward to the newer site at www.soundcityreading.net. I have strong mixed emotions about discontinuing the older site. I originally posted it in 2008, if I'm remembering correctly. 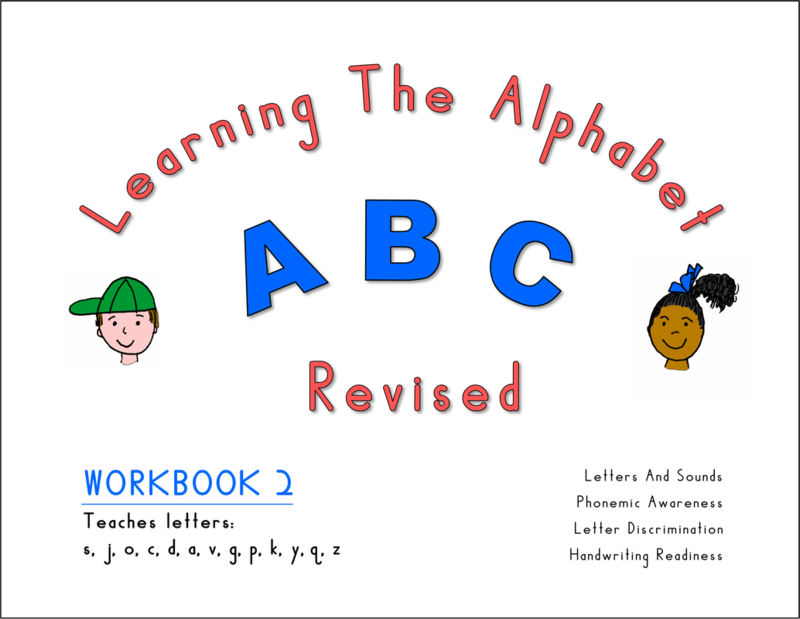 I updated it regularly with the newest versions of the phonics books I created. I was able to see a map showing the locations from which people were downloading pdf files from all over the world. It was very exciting to see more and more countries colored in on the map. 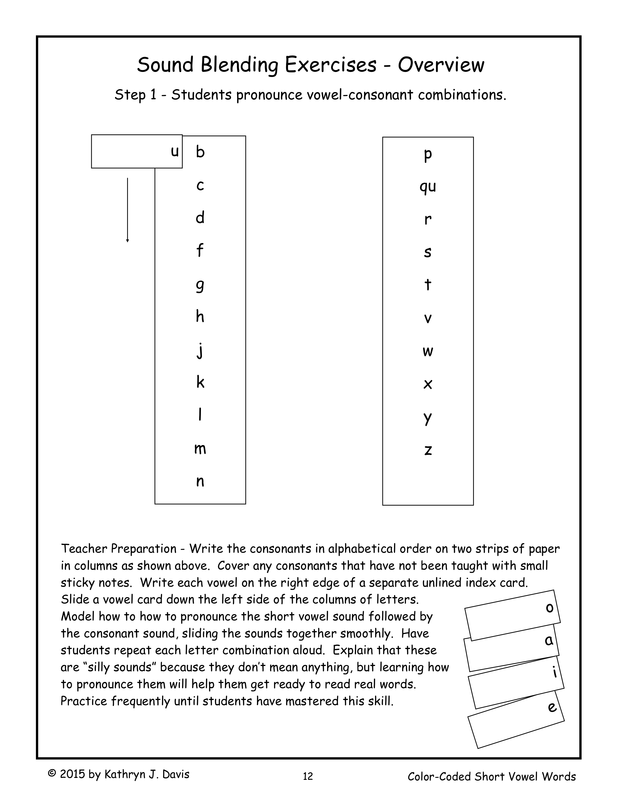 The web site also provided a way to share phonics materials that I created with fellow teachers in Shelby County. The software platform for the old site was completely outdated, so much so that my newer computers could not even log on to the site builder any more. Yet, I didn't have the heart to take it down because hundreds of people were still visiting the site every week. The hosting network updated to a new platform but I was stuck in the old one. It became difficult to even communicate with the web hosting site at all. So today is the day that the old site is coming to an end. As I looked at the old site for the last time, it struck me how much better the new Weebly site really is. I sincerely hope that the users that have visited the old web site faithfully will find many things to like about the new site. I have changed to a newer "theme" for the Sound City Reading website. The format is different but I'm hoping it will not be too difficult to navigate. I had to make some trade offs as I've gone through this process. A major improvement is that the area on the page on which I can display materials is wider. This will allow me to place sound chart pages and picture-word pages side by side on the pages. The pages appear to me to be sharper and clearer as well. After looking at this new version on my PC and Mac laptops, I can see that some of the charts and images are too tall to fit within the screen area. To fix this, adjust the window to make it narrower. This will force the images to become smaller. Then they will fit on the screen. On larger screens this won't be a problem. The site construction controls include an ability to create sections. This will make it easier for me to add new material. I'm not happy with the blog format! The new website version will not allow me to add a sidebar, which I had before. However, it appears I can add the same pictures I used before within each post. A little more trouble, but doable. However, there is no workaround that I can find that will make the blog entries visible until you click on them. If you have any display issues with the new version, please let me know. My e-mail address is kathjdavis@gmail.com. 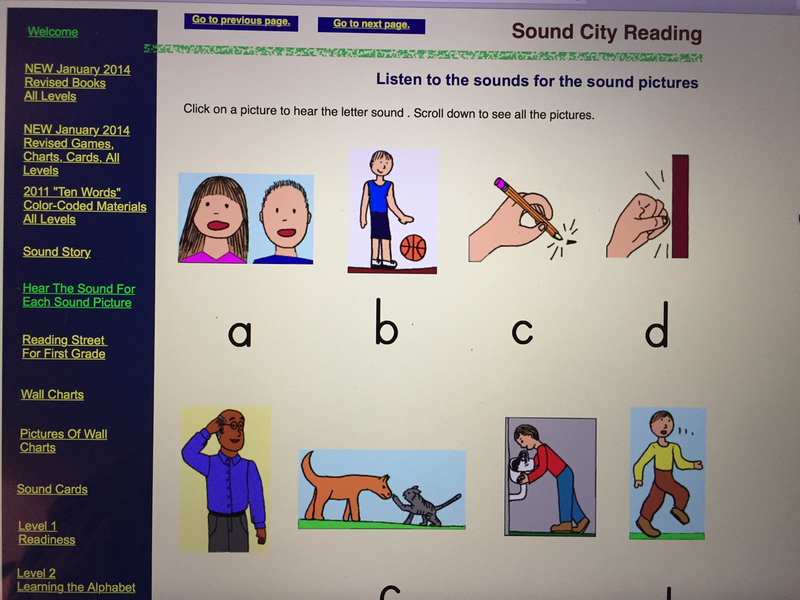 I've updated the overview charts and the flow charts showing all of the Sound City Reading phonics books. Click on any chart to enlarge it. ​The changes to the overview charts make it more clear that it is not necessary to use every book in a given level. You could choose, for example, Book A OR Book B OR Book C at a particular level. 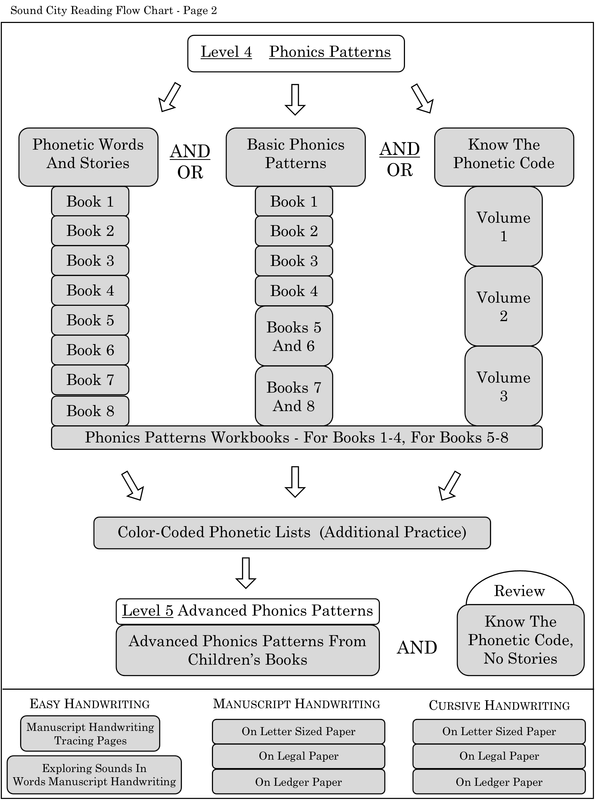 The different options may present the material in a different order (as in the short vowel books) or in a different format (as in the phonics patterns books). Although having a variety of books at some of the levels may be initially confusing, the advantage is that you can fine tune your instruction by selecting the particular books that are best suited for your students. 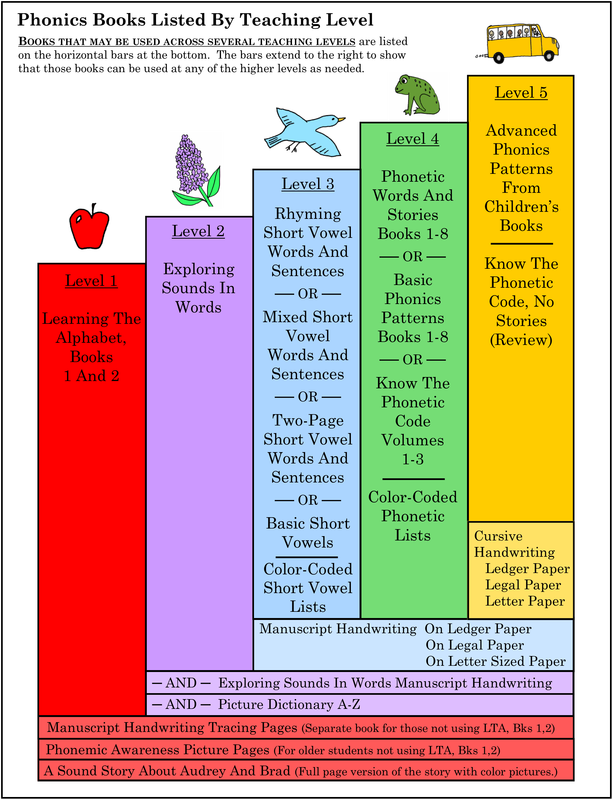 ​The overview charts give a range of suggested grade levels for each group of books. 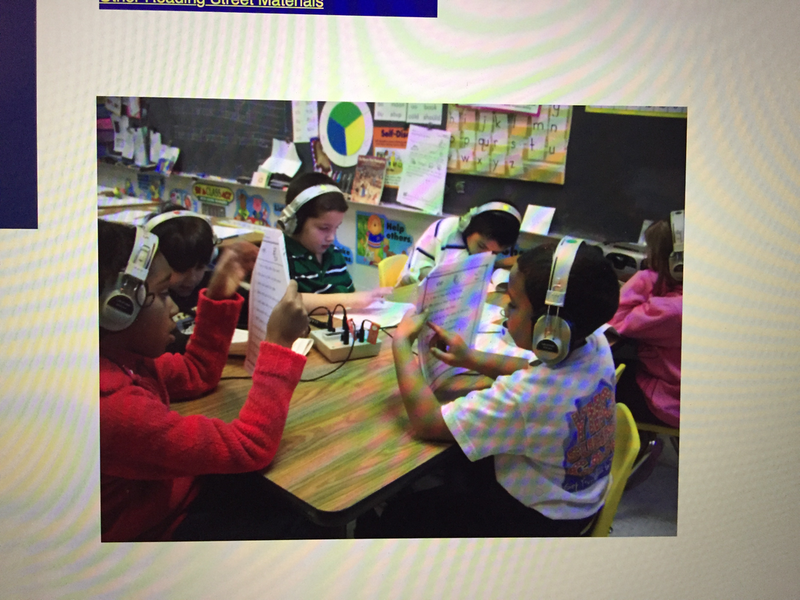 The books are not limited to a single grade level, so that they can be used at any level as needed. The flow chart pages have been changed to show two alternate routes for beginning readers. 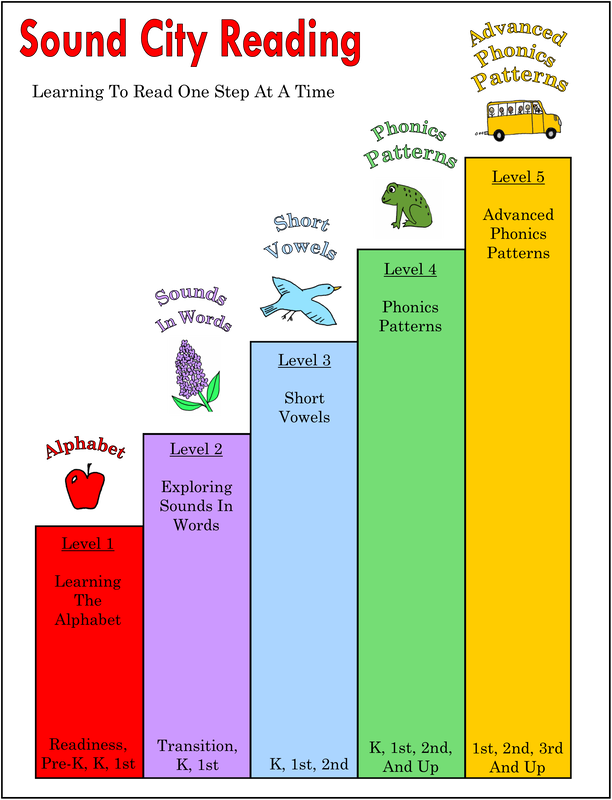 You may choose to complete the Learning The Alphabet books, then the Exploring Sounds In Words book, and then one of the short vowel books. Or you may complete the Learning The Alphabet books and then work through the Exploring Sounds In Words book and the Mixed Short Vowel Words And Sentences book at the same time, integrating the daily instruction. I've revised the Learning The Alphabet books and have uploaded the PDF files today. A separate teaching guide for these books will be posted in the near future. These books are perfect for students who are learning the alphabet letters. 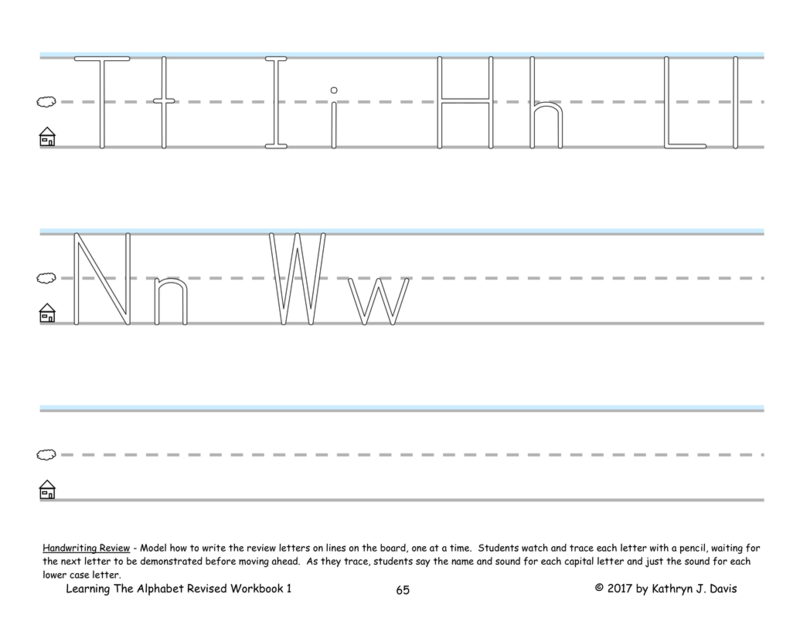 I developed these pages for my grandson when I was teaching him the alphabet. The PDF files are copyrighted but they may be downloaded and printed by teachers, parents, and tutors, to use with their own students. 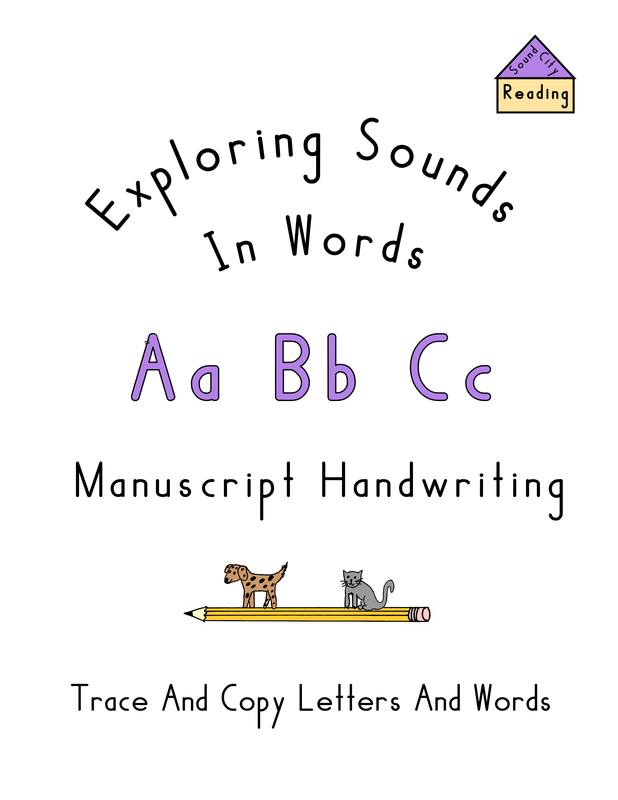 I had previously thought that I might combine these books into one book and put the handwriting and sound story pages into a separate book. After more thought, I decided that since this is the very first book in the Sound City Reading program, I should leave everything together. 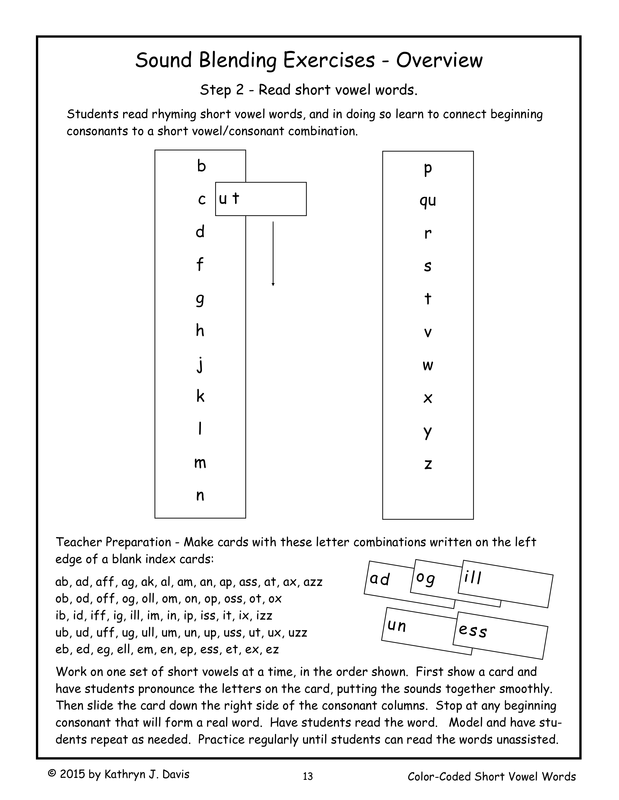 This will make it easier for teachers and parents to follow the teaching sequence. All you have to do is go from one page to the next, in the order in which the pages appear in the book. The changes in the books are as follows. The front and back cover pages are printed in color. The rest of the book has all black print, as before. The handwriting pages with the large letters have been changed. The letter outlines are narrower. (See the pictures below.) This allows students to finger trace the letters first and then trace them with a pencil. The order of the oral blending pages has been modified. 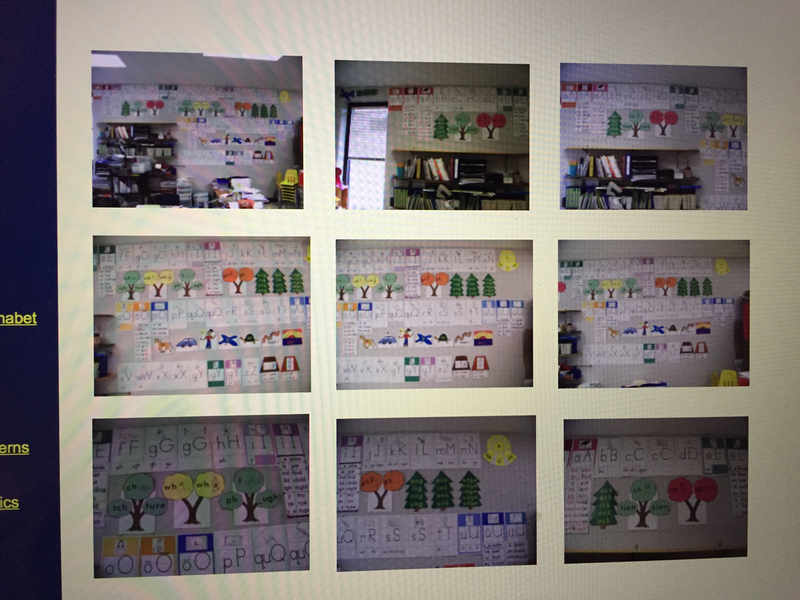 In Book 1, students complete three compound word pages, four two-syllable word pages, and six two-sound pages. 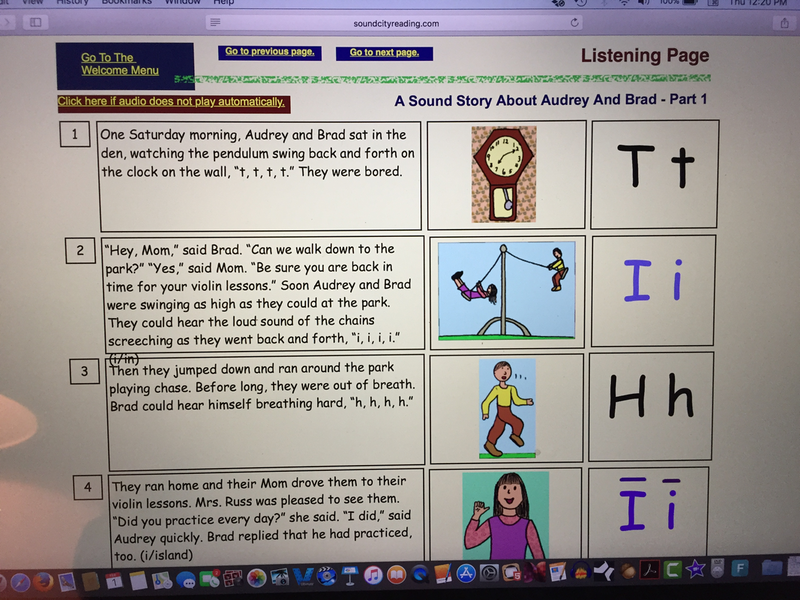 In Book 2, students complete two two-sound pages and eleven three-sound pages. The purpose for this change is so that there will be a gradual increase in difficulty spread across both books as students complete the pages. 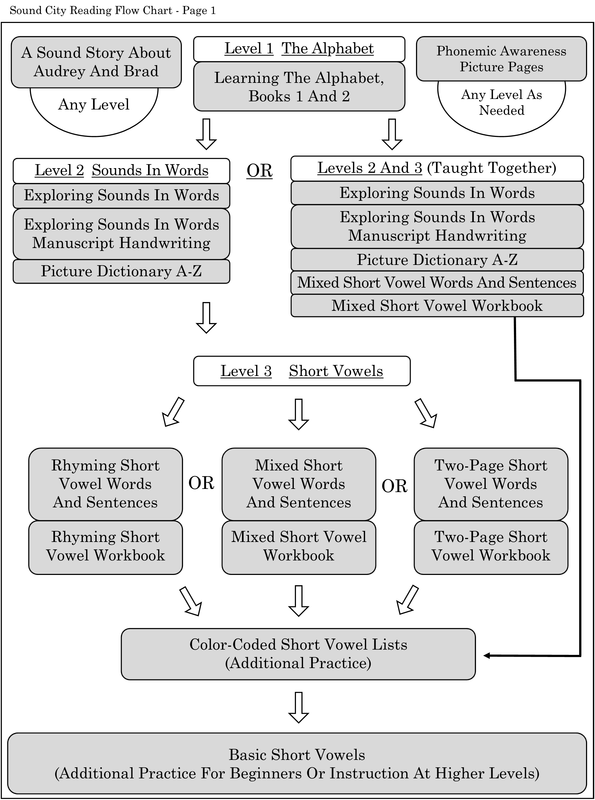 Both books include six pages of two-syllable words at the end of the book as extra practice, to be used as needed. 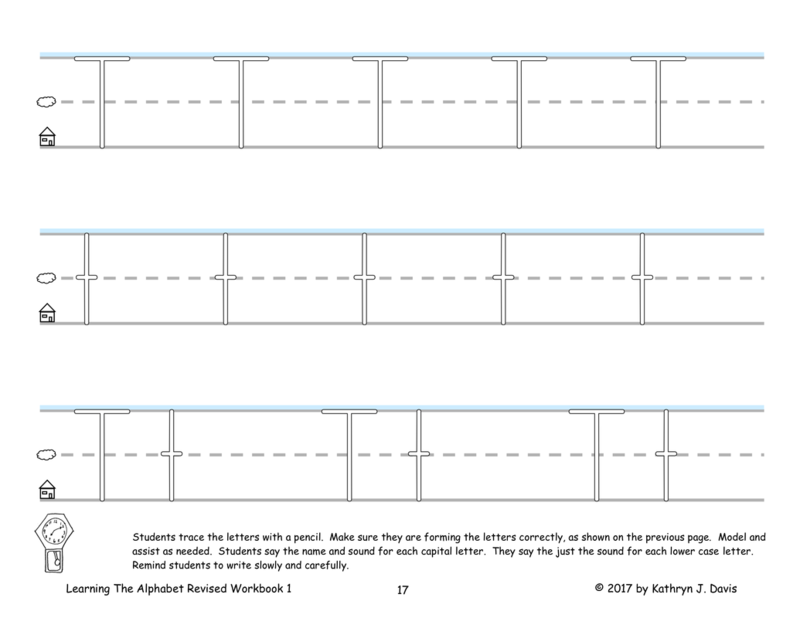 Due to the addition of the extra handwriting pages, the teaching guide will become a separate book. 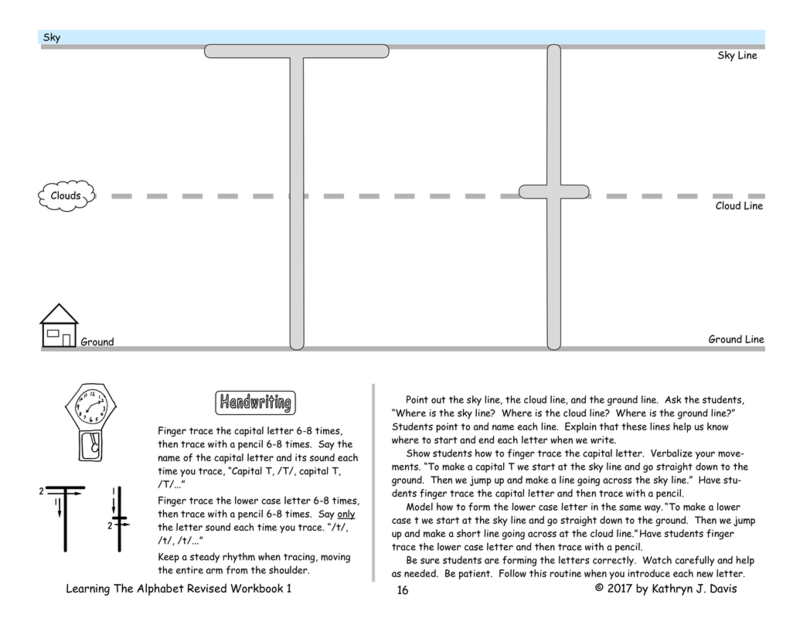 However, brief instructions are included on each student page in Books 1 and 2. 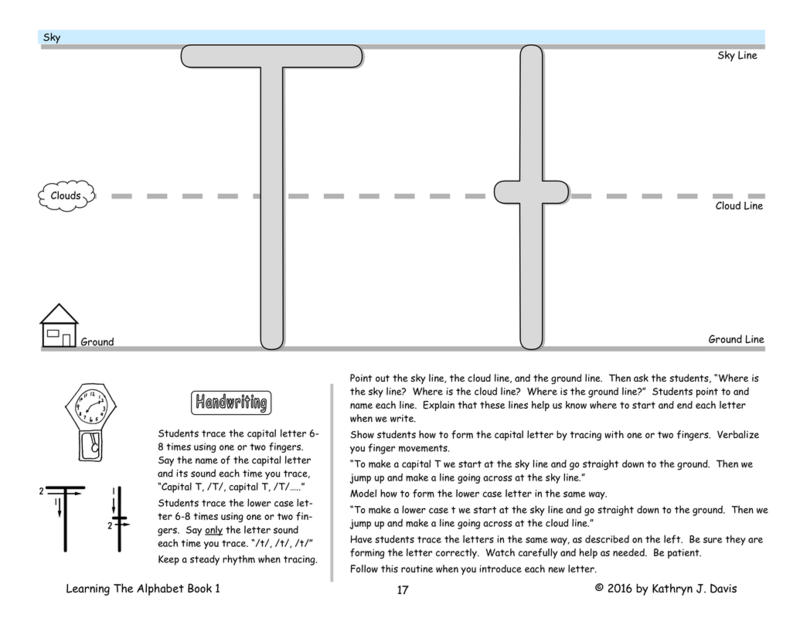 Please use the teaching guide in the original Learning The Alphabet 1 until I get the separate guide posted. This is the handwriting page with large letters in the original version. Students finger trace the letters. This is the handwriting page with large letters in the revised version. Students finger trace the letters, and they can also trace the letters with a pencil. The letter introduction page with small letters has not changed. 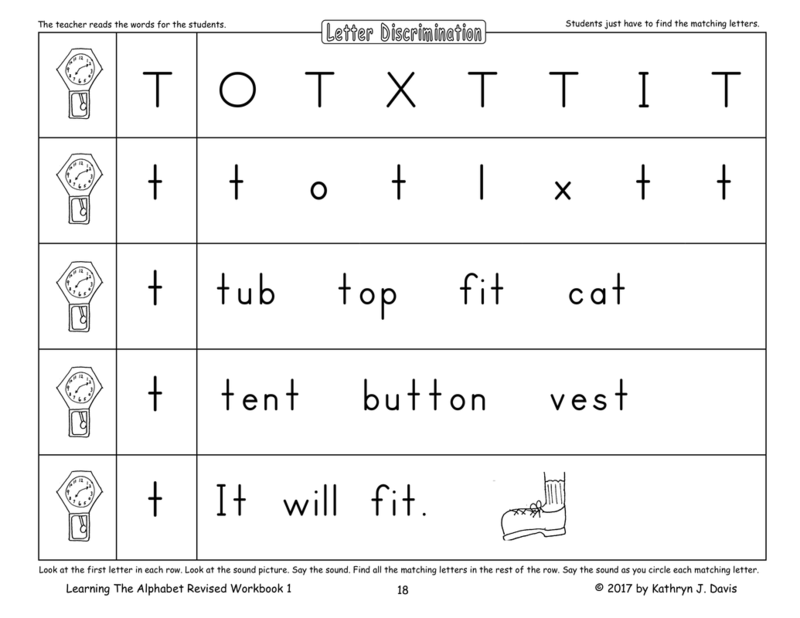 A handwriting review page has been added after each new letter has been taught. Students also study a page with words and pictures. Each word on the page begins with the new letter. The students look at the pictures to figure out the words, with the teacher's help. As students pronounce each word, they listen carefully for the first sound, and circle the beginning letter. 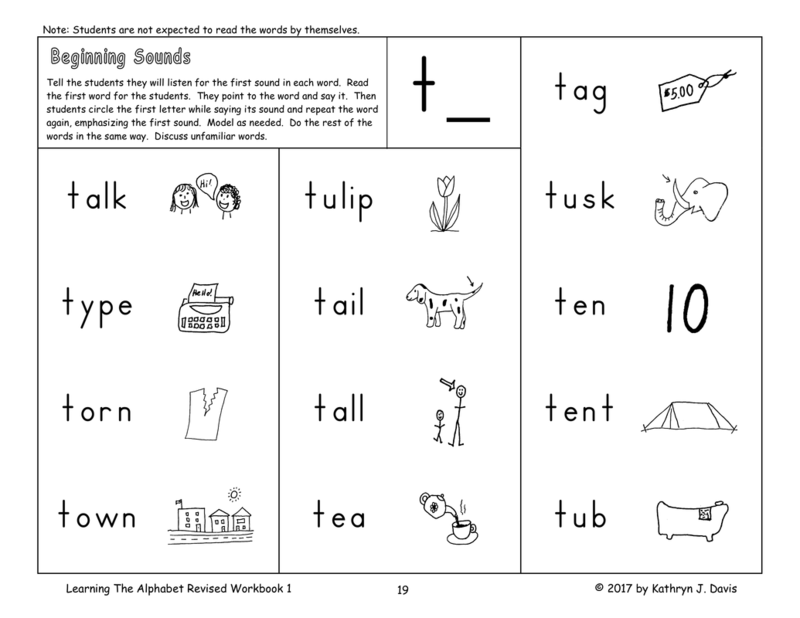 This introduces them to the concept of beginning sounds in words. The begin to understand that the beginning letter in a written word represents the first sound in the spoken word.